Economists believe that the inverted yield curve is a consequence of investor concern over slowing global economic growth. As of 4/2/2019, the 10 Year US Treasury rate had dropped more than 80 basis points since its peak in November 2018. 30 day Libor is now approximately 22 basis points above the 5 Year US Treasury rate. This is an anomaly. Yield curve inversion has been a reasonably accurate indicator, but certainly not a cause of recession. Given the strong labor market and low unemployment, many economists suggest that this inversion might be different. 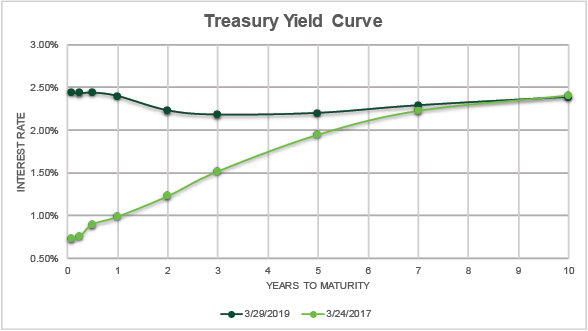 The chart below illustrates today’s flat yield curve (the dark green line). The light green line reflects the curve from two years ago, and this is a much more normal trajectory. Currently, the five-year swap rate is 22 basis points below 30 day Libor. So, a borrower could fix a floating rate loan via a swap and have a fixed rate for five years that is 22 bps lower than the initial floating rate. This is rare and a function of the yield curve inversion. If Libor does fall over the next few quarters as the market expects, this advantage would disappear. However, this swap strategy does provide borrower benefits such as fixing the desired DSCR and deserves consideration. The market believes Libor will fall from this point. As a result, interest rate cap costs have fallen significantly. As an example, the current cost to cap $100 million for two years at a Libor strike of 3.00% is $124,000. On November 8, 2018 this same cap would have cost $953,000. Borrowers need to seriously consider utilizing caps in this environment as a means of “locking in” a maximum interest rate while benefiting from the potential of subsequent falling Libor. CBRE Capital Markets has observed significant outliers in spread pricing as the market absorbs changes in interest rates. The inefficient market makes it imperative that borrowers cast a wide net when pursuing financing options as the market is in “price discovery” mode. Some lenders are trying to institute floors on both the fixed and floating rate financings, but these are not prevalent at this time. Shane Seitz joined CBRE’s U.S. Healthcare Capital Markets in 2018 after ten years at Ventas, a leading healthcare REIT and an S&P 500 Company. He specializes in structuring and negotiating large real estate financing and equity placements for corporate clients, private equity groups, local real estate investors, developers and healthcare providers. Shane has structured and capitalized over $10 billion in real estate transactions during his career. 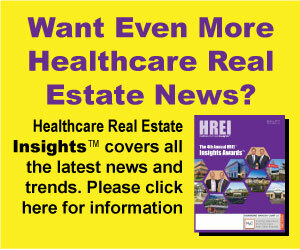 These transactions include medical office buildings, ambulatory surgery centers (ASCs), urgent care centers, lab and research facilities, seniors housings facilities, hospitals and wellness centers.